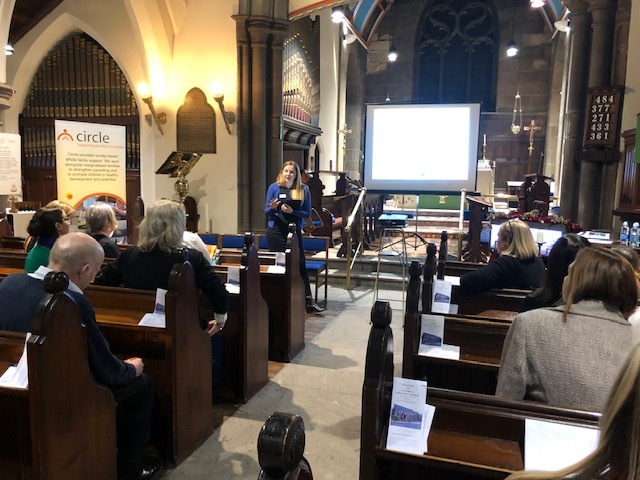 Circle along with our partner, Addictions Support & Counselling, launched the external evaluation of the Women’s Outreach Team: An Alternative to Custody, celebrating the work achieved by the team. We were extremely grateful to Aileen, a parent supported by the Women’s Outreach Team, for sharing her experiences. Aileen, and her children, are moving forward with a sense of hope and excitement for their futures thanks to the work that Circle supported them with. Many of the women who Circle work with report being at their lowest ebb, frustrated with the limitations of available services and have very often been the victims of domestic abuse, turning to alcohol and drugs as an escape. Both Dr Briege Nugent (Independent Researcher) and Karen Hancock (Economist) the two authors of the evaluation were also present on the evening. They shared the key findings from the evaluation including the startling statistic that 94% of the women who engaged with the service had not re-offended. The cost of imprisoning a mother, in addition to care costs for any children involved as well as future costs of re-offending or rehabilitation, are extremely high whereas Circle’s service only costs a fraction of this. In further examining the fiscal, economic and societal benefits of the service the “most valuable immediate social benefits are improved mental health” and the “biggest immediate fiscal benefits are to Children’s Social Services”. We would like to say a massive Thank You to all for participating in the evening.